The 12th annual Good Food Festival & Conference is scheduled for March 24-26 at Chicago’s UIC Forum. Exhibitor registration is open; click here to see an exhibitor kit that includes an application form. Several of our previous exhibitors have volunteered to share their experiences and the value of participating in this event. 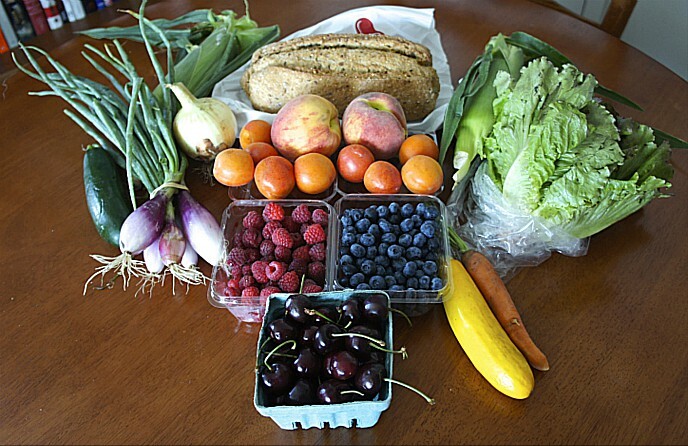 Here are the reflections shared by Robin Schirmer, a longtime participant in the Good Food Festival & Conference, who is project coordinator for Band of Farmers: The Chicagoland CSA Coalition. 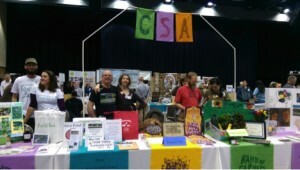 Band of Farmers participates in the Good Food Festival & Conference’s CSA Pavilion each year. “I’m a Farmie.” That’s what my button says. I received it from a fellow Good Food advocate several years ago at a FamilyFarmed Expo, and I still wear it proudly. It describes me to a T.
Robin Schirmer is project coordinator for Band of Farmers, whose Chicagoland CSA Pavilion has become an integral part of FamilyFarmed’s annual Good Food Festival. I’ve coordinated almost 60 one-time indoor farmers markets in Chicago-area churches. I’ve worked five seasons for Tomato Mountain Farm of Brooklyn, Wisconsin, selling and supervising others at dozens of farmers markets and coordinating a large home-delivery CSA. Now I coordinate Band of Farmers: The Chicagoland CSA Coalition, a farmer-led coalition of Community Supported Agriculture (CSA) operations that serve the greater Chicago area. Yet I’m not a farmer. And though I eat, I’m not a foodie. I’m a farmie — a farm groupie, a farmers’ market junkie, a supporter of small-scale family farms, and one who is continually learning the challenges and joys that they face. Whatever I’ve done in this arena, I’m in it for the farmer. I have attended every one of the Good Food Festival & Conference events held annual by FamilyFarmed, a Chicago-based nonprofit leader in the Good Food movement, for a half-dozen years or more. 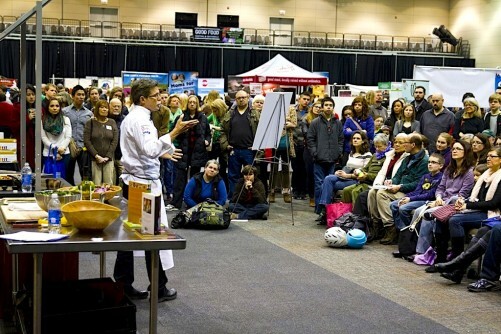 I’ve seen it grow from the two-day FamilyFarmed Expo to the three-day event held each March in Chicago, which draws more than 5,000 producers, buyers, entrepreneurs, experts, advocates, policy makers and members of the public to learn, interact and be inspired. I’ve moved with it from the Chicago Cultural Center in the Loop to the UIC Forum, taking up every inch of available space with creative panels, workshops, demos and exhibitors. I’ve watched it become the must-see local food and farming event of the year, all the while reinventing itself to stay on the cutting edge of the Local Food movement. While I’ve followed the trend, FamilyFarmed and the Good Food Festival & Conference have set the trend and stayed ahead of it, building the movement and keeping it from morphing into a mere fad. In my capacity as a farmie, I’ve participated in Good Food Festival planning meetings; exhibited for Tomato Mountain Farm at the Festival, held on Saturday, and the Trade Show on Friday; moderated a panel or two; attended workshops on everything from aquaponics to beekeeping; attended the Financing Fair on Thursday; and, more recently, partnered Band of Farmers with FamilyFarmed to create a CSA Pavilion, which offers Festival-goers a one-stop opportunity to chat with a dozen or more CSA farmers and hone in on their choice of CSA offerings that best suit their needs. The 2016 Good Food Festival & Conference will be held March 24-26. This event offers so much; even if you attend all three days (I recommend it), you’ll wish there were two of you so you could take it all in. Whatever your Good Food interest — as a farmer, foodie, policy wonk, producer, retailer, artisan, investor, food business wannabe or farmie—there’s much to engage, educate, and energize you at the Good Food Fest. This entry was posted in Community Supported Agriculture, CSAs, Direct Farm Marketing, Family Farms, Farm businesses, Food Entrepreneurs, Good Food Festivals, Good Food marketing, Small Farmers, Sustainable food retailing, Young farmers and tagged Band of Farmers: The Chicagoland CSA Coalition, Community Supported Agriculture, CSAs, Direct market farming, FamilyFarmed, Good Food, Good Food Festival & Conference, Small farms. Bookmark the permalink.